Discussing ways to improve the current Barcelona squad may seem to go against the classic proverb of fixing something that isn't broken. 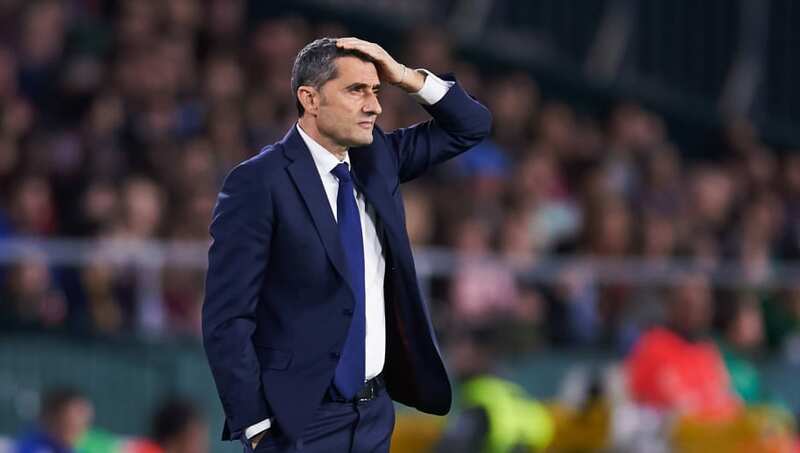 After all, Ernesto Valverde's side are currently comfortably top of La Liga and are safely through to the quarter finals of the Champions League - with many tipping the Catalan club to lift the trophy at the Wanda Metropolitano in May. There is also a Copa del Rey final against Valencia to look ahead to for the Blaugrana, making a historic treble look a realistic possibility for ​Barca this campaign. Amongst all the success however, the club run the risk of heading into next season with a squad on the decline, with several key players potentially entering into the twilight of their footballing career at the top level. Here is how the Barcelona board may look to improve the team this summer. It has been reported recently that the Catalan club could be looking to cash in on French international defender Samuel Umtiti, with ​Manchester City and ​Manchester United reportedly monitoring his situation. However, even if Umtiti stays at the Nou Camp, Ernesto Valverde could use another option for his back line going into the new season. Long-serving central defender ​Gerard Pique is now 32 years old, and an injury-plagued Thomas Vermaelen is also the wrong side of 30, therefore an established but youthful option would be ideal. Barcelona is constantly being mooted as a potential destination for Ajax's impressive centre back Matthijs de Ligt, with the 19-year-old Dutchman looking to complete a move to a top club this summer. Although it may not be easy for the Blaugrana to complete a move as there will be plenty of competition for the much sought after defender. ​Napoli's Kalidou Koulibaly and ​Inter's Milan Skriniar are also viable options for Valverde following impressive campaigns for their clubs this season. Jordi Alba is undisputed as Barca's first choice option on the left side of defence, however the Spaniard has relatively little competition. Versatile La Masia graduate ​Sergi Roberto can fill in at full back, however it takes away a vital threat from the Barcelona attack, with Roberto less able to match Alba's ability to make rampaging runs and supply unrelenting pace and energy down the flank. 20-year-old Marc Cucurella is currently on loan at Eibar and has been first choice at left back for Basque side, playing 22 La Liga matches. Cucurella's exposure to regular Spanish top flight football could be Barcelona's final step before bringing him into their squad for next season. Lyon's Ferland Mendy has reportedly attracted the interest of Barca, following his impressive displays in Ligue 1 this season. Real Betis' Junior Firpo would however be a more similar match to Jordi Alba in terms of attacking attributes, with Firpo also possessing the ability to play a more advanced role within the midfield as well as a full back. With Sergio Busquets, ​Arturo Vidal, ​Ivan Rakitic and recent arrival Kevin Prince Boateng all in their 30s, and ​Rafinha's injury hell looking never ending, it is likely that Valverde could look to refresh the centre of midfield and potentially sell on one of the aforementioned. 21-year-old Carles Alena has been given more opportunities within the first team, following the club's decision to cull their central options, with ​Andre Gomes and Denis Suarez both departing on loan deals. With the success of 22-year-old Brazilian recruit Arthur this season amongst a midfield of experienced and classy players, Barcelona may be tempted to bleed in another relatively inexperienced player with the view to them being the heir to Busquets' defensive mastery or Rakitic's creative output. Versatile German Julian Weigl presents a tempting option for Barcelona to consider, with the defensive-minded 23-year-old potentially succeeding Busquets as the club's first choice holding midfielder. Dortmund may also be looking to sell, following their acquisition of Axel Witsel, which has made Weigl less of a key member of Lucien Favre's team. Thomas Partey is another similar option, however he could prove rather tricky to prize from league rivals ​Atletico Madrid. ​Wolves' Ruben Neves could also provide an answer as another creative midfield option. I know, Barcelona have the firepower of arguably the greatest player of all time amongst their squad and have scored 73 league goals so far in La Liga, however they could still look to improve their forward line. Yes, really. Once again there is an issue with ageing players, with ​Luis Suarez now leading their line at 32 years old. However in this case there is also a question mark behind their recruitment last summer, with Brazilian attacker Malcom making little impact since joining from Bordeaux. There also seems to be a shortage of young strikers coming through the club's La Masia academy who will be ready to step into the first team. 19-year-old Abel Ruiz has lead the line for Barcelona B, but has only managed two goals in twenty appearances. 23-year-old Marc Cardona is another player currently on loan from Barcelona, however two goals in nine La Liga appearances for Eibar is unlikely to persuade the Barcelona faithful that he is worthy of being amongst their first team for next season. It is looking increasingly likely that we are heading towards another summer transfer window which will be dominated with a 'will he won't he' situation in regards to Atletico Madrid forward Antoine Griezmann potentially joining the Catalans. Eintracht Frankurt's impressive Serbian striker Luca Jovic has also been heavily linked with a move to the Nou Camp, with the 21-year-old potentially providing the club with a cheaper option than pursuing a deal for Griezmann. Ajax's Kasper Dolberg and RB Leipzig's Timo Werner are also rumoured to feature on the club's summer shortlist.